Auto Italia are service and repair automotive mechanic specialists based in Perth, Western Australia and have been trading successfully for the past 26 years. We do mechanical work on all makes and models of cars, however we specialise in the mechanics and restoration of European Cars such as Fiat, Alfa Romeo, Lancia and Ferrari. Our work includes engine rebuilds, modifications and restorations. We at Auto Italia always welcome new business and car enthusiasts. 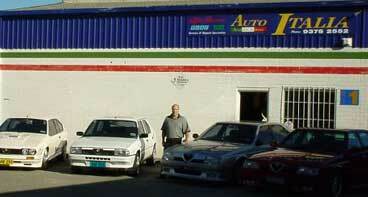 Auto Italia, as we are formally known, began in 1980 as Mario's Auto Repairs based at Osborne Park Western Australia. In 1989 we moved to Morley where we are currently located today.